This one act play with music was the surprise of my weekend. Not because of what I already knew about it, of course, based on press materials and previous word of mouth from friends who saw it at the Hollywood Fringe Festival, but because of something no one had thought to mention. That for all its rowdy comedy, bawdy innuendo and drunken delights, Michael Shaw Fisher has written, and performs, a piece that reveals Shakespeare’s heart in moments of genuine vulnerability making it more than simply a passing fringe fancy. 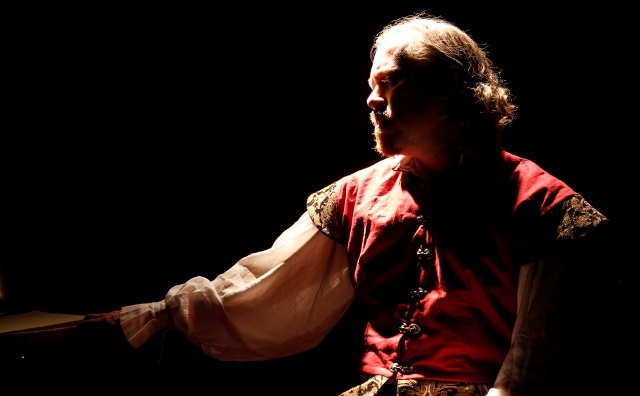 This one man 75-minute Elizabethan tavern musical could easily tour the country in every intimate venue, educational setting, pub or cabaret house smart enough to book it. Fisher’s sharp writing, impeccable storytelling, and comedic timing aren’t a surprise given that we’ve previously seen fringe musicals like Exorcistic: The Rock Musical Parody Experiment, Doomsday Cabaret, and The Werewolves of Hollywood Blvd showcase his irreverent wit. But taking on Shakespeare means stepping into some pretty big historical boots and the question is always, is the actor up to the task. Yes, my friends. Yes, he is. His Will Shakespeare is a rock star troubadour but he’s also just a man, and a likeable man at that. In these prescient ponderings on the last night of his life, he defends the legacy of words he leaves to those of us in the bar. Included in the show are a baker’s dozen of tunes accompanied by two excellent musicians (Gordon Wimpress on guitar and Allison Faith Sulock on period instruments – dulcimer, flute, lute, gemshorn, percussion and more). Fisher sings well and switches easily from rocker to balladeer. “Window of Broken Stars” is among the best of the ballads and you’ll be joining in with “Muse of Fire,” a jaunty drinking song that packs a powerful punch before you even know it. Yet always under the showmanship is a gentleness, a thoughtful foundation carefully crafted that makes the time more touching than expected. Director Jeff Sumner efficiently stages the piece in Three Clubs’ side room, a venue well-suited to the material, where you can drink during the show. Perhaps it helps that Fisher is also attuned to the heart of a poet, being one himself. It certainly adds depth to Shakespeare’s Last Night Out, a fringe show that deserves its extension. Don’t miss it. Looks like I will need to make time to (finally) see this one! Let me know when you go. If I’m free I’ll see it again.